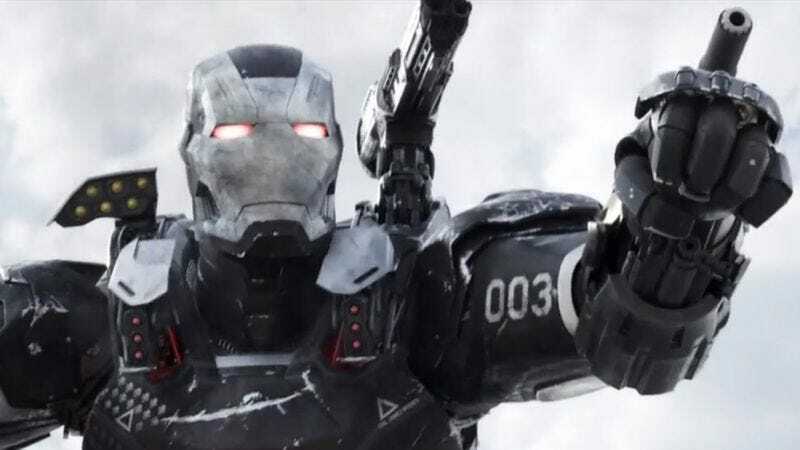 His power: War Machine is the name given to Rhodes when he’s wearing the Iron Man armor—albeit an adjusted and slightly less advanced version of the technology. It possesses many of the same abilities as the Iron Man suit (flight, pulse blasts, artillery) but in slightly altered, more gun-centric form (fitting, for a longtime military man). His story: An old friend of Tony Stark, James Rhodes is first introduced in Iron Man as a lieutenant colonel in the U.S. military, continually trying to keep Tony focused in his business dealings with the government. By the time of Iron Man 2, he’s become a colonel and is tasked with getting the Iron Man tech in the hands of the army, eventually stealing the Mark II version of the suit from a drunk and troubled Stark. He delivers it to his bosses on the condition that Rhodes be the sole pilot. After defeating Ivan Vanko when that villain briefly took control of the suit, Rhodes became the face of the military’s new symbol, rechristened the Iron Patriot (at the start of Iron Man 3). But he’s captured by Aldrich Killian, who uses the suit to kidnap the president. After recovering it, Rhodes begins using the suit regularly on missions, and after the defeat of Ultron, he officially joins the team as an Avenger. However, in Captain America: Civil War, friendly fire from Vision knocks him out of the sky, severely injuring and temporarily paralyzing Rhodes. He requires exoskeletal legs to walk again, and it’s unclear if he has a future as an Avenger. Played by: Terrence Howard in Iron Man; Don Cheadle in Iron Man 2, Iron Man 3, Avengers: Age Of Ultron, and Captain America: Civil War. Currently, War Machine is: Recuperating from his injuries at the Avengers compound. Where will we see him next? Unknown, though an appearance in Avengers: Infinity War wouldn’t be surprising.